New! Our Waffle Kimono Robe in 100% Cotton now in a shorter 38 inch length from the back of the neck to the bottom hem. Julia is wearing the 38 inch length (order here) and David is wearing the 48 inch (click on red link below) length to give you an idea of the lengths we offer. This shorter Kimono Waffle Robe in 38 inch length offers 3/4 length sleeves, ultra light weight waffle material in a 7 oz. per yard weight, two side pockets, belt, and 2 belt loops on each side to adjust for height. Perfect travel robe for bulk-free packing. Premium Quality made exclusively for Wittmann Textiles in Turkey. Color - White. Need a Longer 48 inch length Kimono Robe pictured on David above? 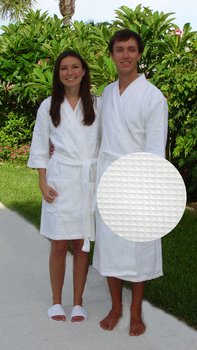 If you are looking for a little heavier, more premium, medium weight Waffle Kimono robe - see our Diamond Waffle Robe.